Kenyon has several transportation resources including a free shuttle bus to the nearest town, Mount Vernon, and a daily bus to Columbus. The CGE also provides information about traveling beyond Knox County and getting to and from the airport. A bicycle can be a very useful thing to have at Kenyon. There is a beautiful bike trail just down the hill from Kenyon that allows you to ride into Mount Vernon or as far as Danville safely. The trail is for bicycling, walking, running, rollerblading, etc., but not for horses or motorized vehicles. The Kenyon shuttle is free and routinely stops along Coshocton Ave. (movie theater, Knox Village Square, Walmart and more) and in downtown Mount Vernon. Bring your Kenyon ID for free service. Download the schedule (PDF). Monday-Friday: 8 a.m. - 10 p.m and Saturdays: 2 - 10 p.m.
Shuttles circle once per hour. Departures from the Kenyon bookstore with stops in downtown Mount Vernon, at the Kenyon Wright Center, and on Coshocton Ave. Purple Line Schedule (Gambier-Mount Vernon). Check the bookstore for full schedule. Mount Vernon is the nearest city, about a 10-minute drive from Kenyon. It has a population of about 16,000 people. Mount Vernon has an historic main street with a bookstore, two coffee shops, a flower shop, restaurants and several boutiques and antique stores. There is also a major avenue, Coshocton Ave., with many popular stores including Walmart, Aldi, Kroger, Sears, Staples, JC Penney, Peebles, Marshalls and Pat Catan's. For an updated list of restaurants in Mount Vernon (and other towns in Knox County), visit visitknoxohio.org and click "Places to Eat." For shopping, click "Things to Do --> Shopping." 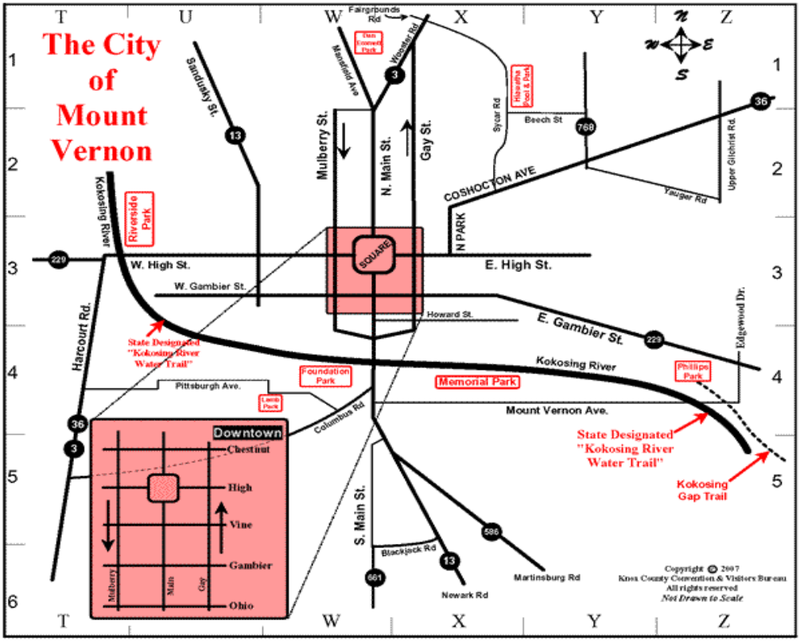 Download a map of Mount Vernon. Other than the first time that you arrive at Kenyon, when the CGE or your host family picks you up, you will be responsible for getting yourself to and from the airport. Please do not assume that your host family will be able to transport you to the airport or the bus station when you travel. Your first strategy should be to arrange your travel to coincide with the shuttle buses that are set up to transport students during breaks. Please do not call your host family a few days before your flight or at the last minute to ask for a ride. It is good practice to mention your travel plans to them and then wait and see if they offer to give you a ride. If they do not offer, you should join an organized shuttle service or arrange to travel with other students who are leaving at a similar time. There is a Kenyon virtual message board called Switchboard where students can post the need for a ride or offer to take riders. You can also send an all-student or all-employee email message to try to find a driver. It is customary to offer some compensation to defray costs, with $30 as an average amount. Please remember when you book your flights to think about transportation. If you host family has offered to give you a ride, please keep in mind reasonable hours. Many families cannot drive to Columbus at night. There are several ways to get from place to place in the United States. The cheapest way is usually by bus, but it may not always be the comfortable or convenient way to travel. For long distance buses, you often have to make multiple connections - some in the middle of the night. Greyhound is a national bus service. There are also several private bus companies that operate from New York to Columbus and along the east coast: GoToBus or Sky Horse Bus. The train system, Amtrak, in the U.S. is pretty minimal. It operates more frequently on the east coast but there is currently no train service to Columbus. You can catch a train in Cleveland, Toledo or Cincinnati. When you make travel plans, remember to plan how you will travel out of Gambier. The best option is to time your travel around the shuttle schedules. If you cannot, remember to make your plans at a convenient time for whomever has offered to give you a ride. You could also plan to spend a night in a hotel close to the John Glenn International airport. GoBus is an inexpensive way to get to John Glenn International airport or downtown from Gambier. View the schedule and buy tickets. ​Kenyon College does not endorse any transportation company and does not vouch for the security of transportation company reservation websites. Kenyon shares the above list so students and their parents are aware of some transportation options. Students are advised to never use their Kenyon password for any service not directly affiliated with the College.